-Less than 50% of executives are satisfied with their strategic planning process. 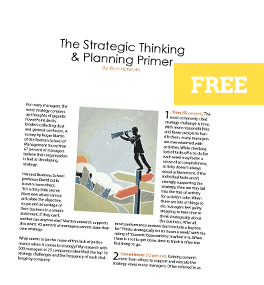 -Only 53% of executives say their strategic planning process focuses on their company’s most important strategic issues, rather than on tactical issues. -Strategy decay: Only 9 out of 500 companies in the S&P 500 managed to deliver total returns to shareholders in the top quartile for more than five years through 1999. Clearly, there is no joy in Strategyville. The mighty company is striking out. Engagement. A study by Harris Interactive of more than 23,000 workers, managers and executives found that only 20% understood how their tasks relate to the organization’s goals and strategies. So basically 8 out of every 10 people in an organization aren’t really sure why they’re doing what they’re doing and if it’s having any positive effect at all. Think about your business. What is the overarching strategy? How is what you do on a daily basis helping the strategy to achieve the goals? If you’re having difficulty answering either of these questions, you’re not alone. Research of senior executives from 197 companies by the Economist Intelligence Unit found that on average, most strategies deliver only 63% of their potential financial performance. There are a lot of people out there working day-in and day-out with no connection to the strategy. When that happens, the company is leaving significant revenue on the table for its competitors and creating a disengaged and unsatisfied workforce. Create forums for dialogue. Give people at all levels a chance on a periodic basis to share their thoughts on the business. Providing employees with several key questions on the four core areas of the business (market, customers, competitors and company) is a productive way to harness the team’s thinking. Giving the employees these questions at the beginning of the quarter and then providing an opportunity to share their thoughts at the end of the quarter keeps people actively engaged in generating new insights. Develop a visual strategy. Communicating strategy with words only is a limiting method of creating understanding. Work to translate the strategy into a graphic or metaphor that forms a picture in the minds of employees. Example: a strategy that calls for unprecedented collaboration between three distinct business functions might be represented by stranded steel cable comprised of three individual cables wound tightly together creating a single, stronger one. Focus. One of the primary causes of a lack of enjoyment is the strategy pizza. Companies continually add strategic initiatives and projects to their workers plates without first assessing which of the older ones should be removed. After a few years, it turns into the strategy pizza with everything, overflowing with toppings (initiatives/tactics) that simply don’t fit together (imagine the taste of pineapple and anchovy pizza). While the pizza with every topping imaginable will cause indigestion, the strategy with every initiative imaginable causes frustration and disappointment because of the impossibility of trying to be everything to everyone. Research published by Michael Mankins showed 95% of executives said their company did not have a rigorous and disciplined process for focusing top management’s time on the most important issues. The lack of focus is also caused by the inability of workers at all levels to think strategically. In fact, a study showed that 52% of senior executives said their teams were doing poorly in strategic thinking. The inability to think strategically is a root cause of poor focus, poor decision making and the absence of critical trade-offs. Create a business “not-to-do list.” While most organizations do a good job of providing their workers with a list of initiatives or things to do, most have never given any thought to things not to do. The “not-to-do list” prevents the slow leak of resources (time, talent and money) to unproductive areas and activities by ensuring everyone understands what sandbox they’re playing in. Periodically prune the business. Just as trees and bushes need periodic pruning to foster new growth, so too does your business. A helpful tool to prune the business is the Activity System Map. This map provides a visual representation of your key strategic themes (3-5) and the tactics that support each. By visually identifying all of your activities/tactics and their connection or lack of connection to the strategic themes, you can clearly see which activities or initiatives to continue and which to eliminate. The result is a happier workforce because they are now focused on a fewer number of activities having a greater effect on the business and their personal success. Achievement. It’s hard to enjoy working on strategy if you’re getting your brains beat in by the competition. Research out of Harvard Business School has shown companies without a clearly defined and well-articulated strategy were outperformed by their competitors with one by 304% in profit margin and 332% in total sales over a ten-year period. Merry Christmas, but you can forget the bonus check at the end of the year. The concept of strategy is grounded in the idea of defeating the competition. If you’re not one of the top companies or individual performers in your market, here’s a thought: your strategy isn’t working! The reality is for us to enjoy strategy, we need to be skilled at developing and executing it. Otherwise, you don’t have a business, you have a hobby. Look under the hood. When there’s a problem with our automobile, we don’t just stare at the exterior, we look under the hood. In the same way, we need to conduct a diagnostic of our business strategy. Over the years, I’ve administered a 20 question organizational strategy diagnostic to help managers understand where their company can improve. The average score is 11 out of 20 points, indicating that companies are missing out on nearly 50% of their strategy’s full potential. The bottom line is in order to get better, we need to first understand what’s wrong. Build the strategy muscle. Before an athlete can develop the skills to excel in their sport, they first need to develop their muscles. Strong muscles provide the platform for mastering the skills of a sport by enabling strength, coordination, and flexibility. In the same way, business people need to develop their knowledge of the key concepts around strategy (i.e., competitive advantage, value disciplines, 14 types of innovation, etc.). Ensuring each member of your team has a similar and strong foundation in strategy will go a long way to enjoying the ride to success. Joy is defined as “a source or cause of keen pleasure or delight; something greatly valued or appreciated.” While we don’t normally associate joy with strategy, based on its definition, there’s no reason we can’t in the future. The Mongol emperor Genghis Khan, who battled his way to creating the largest contiguous empire in history, wrote, “Happiness lies in conquering one’s enemies, in driving them in front of oneself, in taking their property, in savoring their despair, in outraging their wives and daughters.” Maybe not quite how we’d describe the joy of strategy, but what do you expect from a kooky Mongol emperor?